Scratch on lake. Just e of opa, S side of street. Ask for well done. I'm partial to tex mex, myself, you'd need well done on those, to support the toppings. Last edited by seebee on January 28th, 2019, 1:08 pm, edited 1 time in total. I do not think Wild Onion has serviceable fries, but not really sure. I'm thinking you would be better off delivering the fries from Big Guys yourself - who knows how cold they would be relying on a delivery driver to make the same trip! What about Barclays? I've been pleasantly surprised with our visits there. I'll be happy to be wrong, turns out Wild Onion has "hand cut fries" on their menu. You might as well sit there instead of The Beer Shop (unless you're traveling with a pooch)! As a matter of fact, as my wife reminded me, Wild Onion actually has excelled fries! As for beer ... usually not as good as the offerings at Beer Shop. But hey, nobody's perfect. I think the compromise is beer and fries at Wild Onion, then beer at Beer Shop if we still need beer. Still: with Five Guys gone, clearly DTOP needs a place with good fries. Other than Wild Onion, of course. Order some tater tots to go from Bar Louie. seebee wrote: I'm Mr Momming this week. I can prolly convince Jr to go for a ride to Katy's with me and take one for the team. Maybe Wed. It's been a LOOOOOONGG time. Last time we went, it was a mixed bag of trash and middlin'. 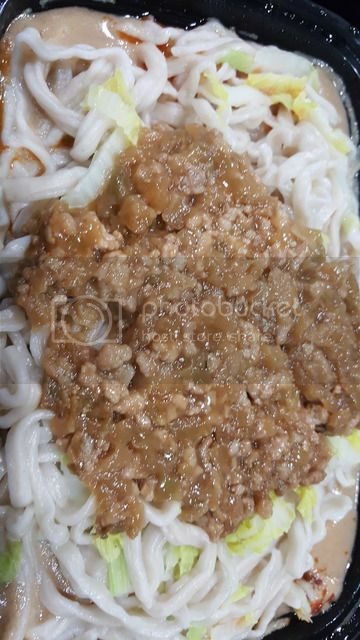 The dumplings were horrific, (full of sugar,) and the noodles were from a pkg. I can roll it into a visit to Carnivore, so I can make it worth it if it still stinks. For nostalgia, and possibly a side of humor, and a glimmer of hope, I'm really gonna try to go tonight, for takeout. We'll get a stir fried noodle of some sort or a Dan Dan if they still do it. Anyone have a suggestion? You might just get photo proof of the outcome here. Dare I post this in the Katy's thread? No. No need to bring them down. This thread is about Oak Park evolving? Well, Katys Oak Park has evolved. Before I start in on it, I should say that for the most part, today's food was better than our last visit. Our last visit was pretty much total slop. This time, there was indeed, a glimmer of hope along with some slop. See? That's better than total slop. Chengdu Dumplings - a step in the right direction. Not special or great, but not horrible. Filling wasn't sweet, chili sauce/oil was decent. 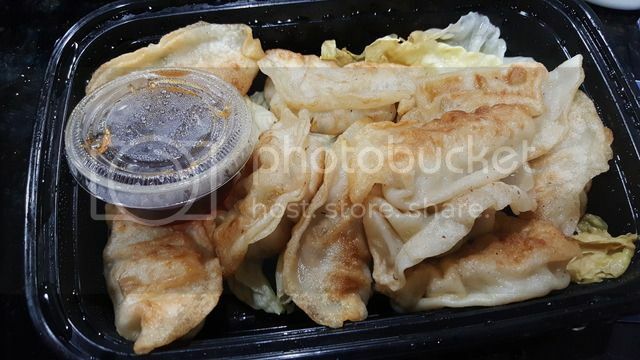 Potstickers - inoffensive, totally edible. Last time, these were bigger, fatter, and full of sweet, brown, meat mixure - completely gross. Today, they were much smaller, filling was white-ish (pork/chicken, perhaps?) not exactly bursting with flavor, but completely edible. Beef and scallion dumplings, pan fried. Decent. My guess is they are from a frozen bag you can buy if you know which brand. These aren't Katy's of old, but still decent. Not bad. Three Chili Fish. This was the tallest midget. Even with travel involved that sucked the crunch out, I still think these saved the meal, and offered a glimpse of hope that someone over there is trying to make decent food again. From this alone, I'll entertain the thought of returning for another trial. Breading/coating was nice, not too salty, and the fish, which was probably the dreaded tilapia, had no muddiness - completely clean, so the flavor of chili oil/ peppery stuff cam through nicely. 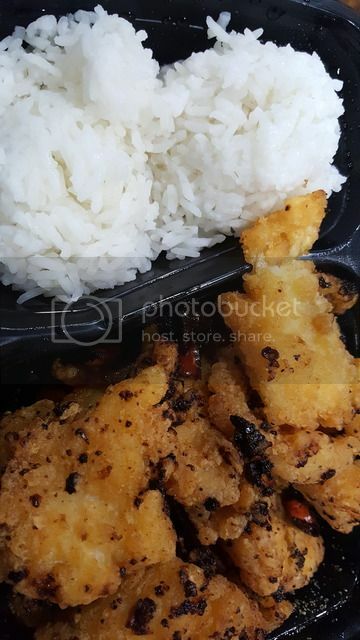 Apologies for not rotating, but, it's fried fish chunks and rice. It was good tho. Worse than it looked. The noodles were shot. Mushy spots and hard spots, but the sauce "stuff" - it ran sweet, which is just sad. Not sure I can stomach this as leftovers. And that brown meat topping? No. Pork particles in grown gravy that was saltier than balls. Just no. I won't dwell on it too much, but it was, in a word - crap. Someone's at least trying. As a whole, it was still better than last visit. Seebee, thanks for taking one for the team. Seeing how your fish came out OK for the most part, I might just give it a try and order a dry chili chicken to see what it has become. Maybe the Oak Park Katy's is moving in the right direction, however, comments like, "inoffensive" and "completely edible" don't really make one jump up and run to the phone to place an order. 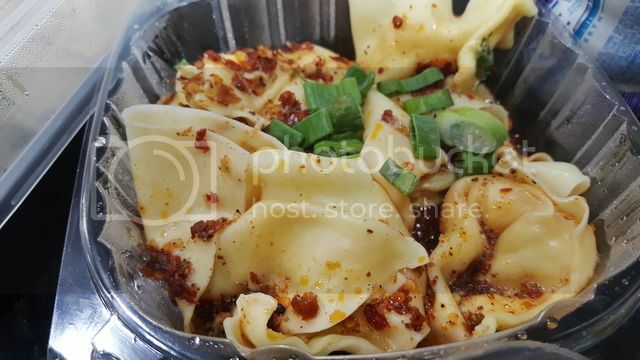 As Chinese in the area goes, we seem to have plenty of "Inoffensive" and "edible" places such as New Star, Lotus, Luo's, and others. There is always hope we get something better at some point. thetrob wrote: Seebee, thanks for taking one for the team. I'm not sure why you would even think about visiting? Because one dish was 'ok' and everything else was awful? Let this place die it's well deserved death. It is Katy's only in name and a disgrace to the memory. Lotus has a page or so of Taiwanese specialities, including some stuff, if memory, serves me, written only in Chinese characters. Has anyone ever tried this stuff? That Dan Dan looks like the inside of a burrito I had the misfortune of overseeing at a Taco John's in South Dakota last week, right down to the pallid refried bean layer. Good job! Thanks for taking this one for the team. I've never been to Lotus, but this is interesting. On their website, they list it as an "Ethnic Food" category! I'd also be curious if anyone has tried it. 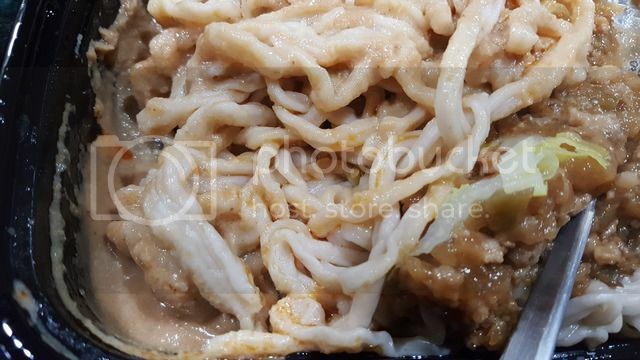 There are preserved vegetable dishes, beef noodle soup, Hakka dishes and more. seebee wrote: Dare I post this in the Katy's thread? No. Never broke a sweat though. Listed as spicy (one pepper) and maybe dumbed down? Maybe need to ask? Best to probably get a cup of hot oil. Gordon Ramsay has me thinking about actually tasty wings, and I'm curious if anyone has a favorite in the area. I'd say Poor Phil's is my go-to when it's not a chain for sportsball (BWW with coupons in Berwyn - I like the potato wedges and sauces but am not a particular fan of the tiny geriatric wings). Who's doing it right? Santander wrote: Gordon Ramsay has me thinking about actually tasty wings, and I'm curious if anyone has a favorite in the area. I'd say Poor Phil's is my go-to when it's not a chain for sportsball (BWW with coupons in Berwyn - I like the potato wedges and sauces but am not a particular fan of the tiny geriatric wings). Who's doing it right? This one is pretty good with Alton Brown as Hot Ones episodes go. I have not found anything great in the area. I like a couple of the BWW sauces, but their wings are inconsistent. Wing Stop is OK, but their wings are similar in size to BWW, I do like their Louisiana Dry Rub wings though. Bar Louie is your expected wing fare, nothing special, standard Franks hot wing. I would be hard pressed to name anything in the area that is destination wing dining or out of the ordinary. Santander wrote:Gordon Ramsay has me thinking about actually tasty wings, and I'm curious if anyone has a favorite in the area. I'd say Poor Phil's is my go-to when it's not a chain for sportsball (BWW with coupons in Berwyn - I like the potato wedges and sauces but am not a particular fan of the tiny geriatric wings). Who's doing it right? I agree with the sentiment around BWW and Wing Stop or the Boss, for that matter. Also agree that Poor Phils is definitely "fine" - sidenote: I also like their buffalo chicken po'boy and recently had a very good catfish po'boy. It's a bit of a ride, but I can't not mention Paisans or, closer to home I like the korean wings from Bodhi Thai. Additionally, I was recently surprised, in a good way, by an order from Lou Malnati's (dine in). All that said, my go-to is Exit Strategy - I like the buffalo or the bourbon chipotle. I had high hopes for the spicy thai but it doesn't really do it for me. Poor Phils' red curry mussels - I'm a fan. Been a long time since I stepped foot in Phils, but every time I go, pretty much a given that I'm getting mussels. It's been so long, last time I was there it was only white or red sauce for mussels. I was immediately drawn to the curry, and it was not a bad showing at all. This is great intel. Exit Strategy (never had 'em) and Cigars & Stripes (great reminder, they are awesome) are in my sights and I've actually never been to a Wing Stop and wouldn't have thought to land on a dry rub there - will do. Thanks to all. Scratch Kitchen I've not quite understood why they do legs - and then have no straight buffalo, it's buffalo ranch - vs. wings. I do like the burgers and cans. Non-OP recent data is that Tacabron still seems to be doing reasonable business. The $7.99 three mixed tacos plus rice and beans on Thursdays is a good deal considering the curtido and salsa bar. I wish the asada and chorizo were better but the pastor and goat are usually fine. We really like Mora (for carryout as much as eat-in), particularly the adobo fried rice and pricey-but-perfect lumpia. Hecho en Oak Park is similarly dear but highly competent in my experience. I'll still take the overall Nando's experience for families over most other sit-downs in the area (though for a chicken sandwich it's hard to beat Firecakes, always - and quite worryingly since there's never anyone in there - assembled from scratch and served piping hot. Order the Quartatto "spicy."). Santander wrote: Scratch Kitchen I've not quite understood why they do legs - and then have no straight buffalo, it's buffalo ranch - vs. wings. I do like the burgers and cans. Cigars and Stripes BBQ Lounge (in the Berwyn part of the Oak Park Area). Many chain places will have very small wings. At one place they threw in a few extra to make up for it. Any sporting bar often will have pretty decent wings. Santander wrote: Tacabron still seems to be doing reasonable business. The $7.99 three mixed tacos plus rice and beans on Thursdays is a good deal considering the curtido and salsa bar. I wish the asada and chorizo were better but the pastor and goat are usually fine. Finally made it here last week and had a good experience. The location will always be special to me as the erstwhile Ameila's, where I had my first restaurant dinner after moving to OP (a sadder impression of a restaurant I have yet to find). Tacabron cleaned the space up nicely and seems to have a competent and comprehensive menu with everything you would want from a taqueria. I enjoyed my chile relleno, smothered in a tasty red sauce. The guac was lethargic (but at least the portion size was decent). Stopped by DKT for beers the other weekend. There were a few additions to the menu that aren't reflected on the website, including a full-size hamburger and maybe a couple of other sandwiches, which are welcome additions. Someone ordered a basket of fries, which reminded me of this thread. They appear to be fresh-cut, but in this instance were severely undercooked...like, raw and potatoey undercooked. Not even close to right, but palatable with enough ketchup, which is how they got consumed. If you get fries here, I would recommend ordering them well-done, or otherwise make it known that you'll be paying attention to them in case you have to send them back. Member when wings were 29c / lb? Vitesse98 wrote: As a matter of fact, as my wife reminded me, Wild Onion actually has excelled fries! As for beer ... usually not as good as the offerings at Beer Shop. But hey, nobody's perfect. I think the compromise is beer and fries at Wild Onion, then beer at Beer Shop if we still need beer. I usually have a Taproom visit near my work every week and this week is all discombobulated. Decided to take My Bride and stay local and after the comments on this thread (and with Kinslahger closed on Monday) we decided to make a stop here. It had been since they first opened since we visited. Beers looked good. Most on the mild side but we were able to find something to float our boat. Needed a little food and an order of fries seemed to be in order. Good as advertised! I think single fried but cooked well done. Some nice crispy little bits. Salted correctly. Not anywhere near a top tier french fry but very good. I hadn't been to Lotus in years but gave them a shot on the lunch special plus takeout "secret" menu (which is roughly translated in the standard laminated dine-in menu, and available in more detail on their website), and was pleased. I liked the balance of portion sizes in the standard Mongolian Beef lunch special, served with a small cup of hot and sour soup interestingly heavy on the black pepper vs. white, and a house spring roll with chicken and shrimp and funky bamboo / water chestnut profile vs. the usual pork and peanut butter. The beef itself seemed good quality but not tenderized (which I actually prefer) and no fried noodles. 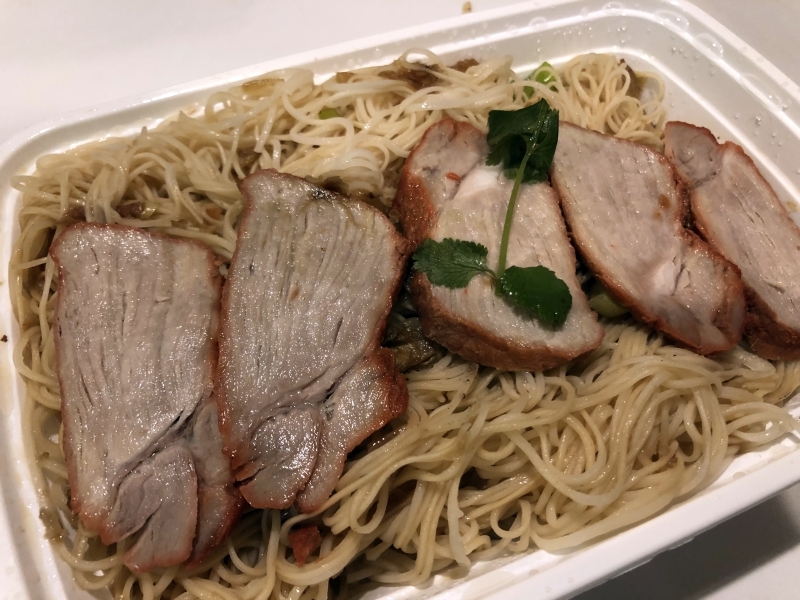 Fried sesame oil noodle turned out to be simply sauteed vermicelli topped with nice char siu pork (higher quality than other pork applications I remember from the menu, but datapoints are not recent). 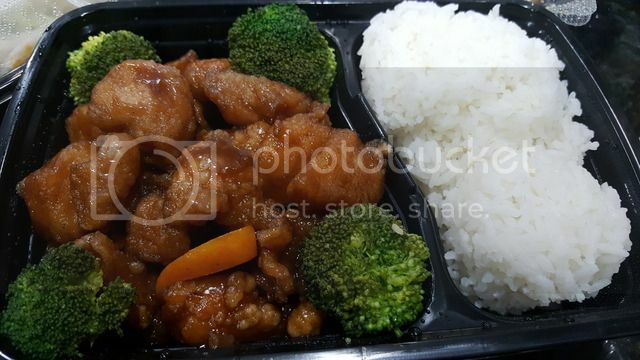 Inoffensive and big portion but not particularly complex for $9.95. 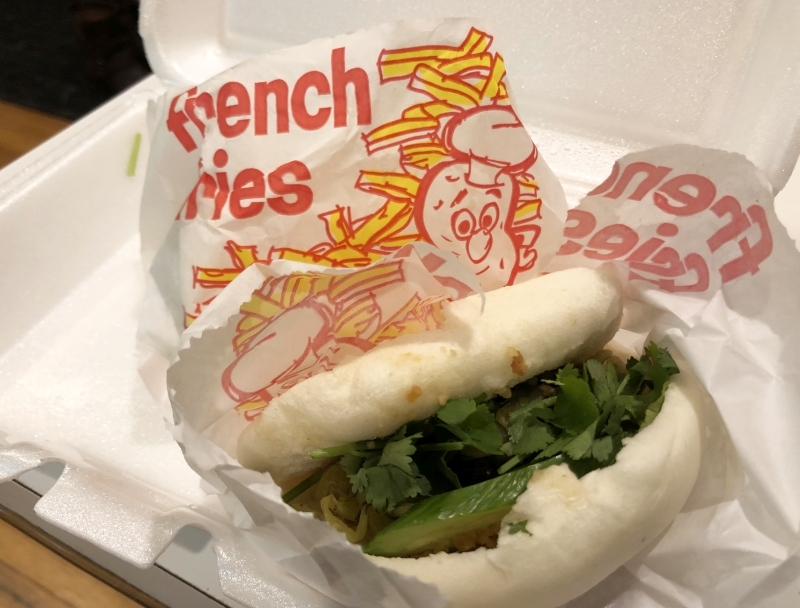 The gua bao (listed as roasted belly sandwiches) were right on, and amusingly served in french fry bags. Really succulent pork belly, nicely ground peanut, fresh house pickles and herbs, extra sugar, fresh pillowy bun. I'm rather astonished I can get these this close to home. ... and I arrived 5 minutes early and had a nice chat with the owner. 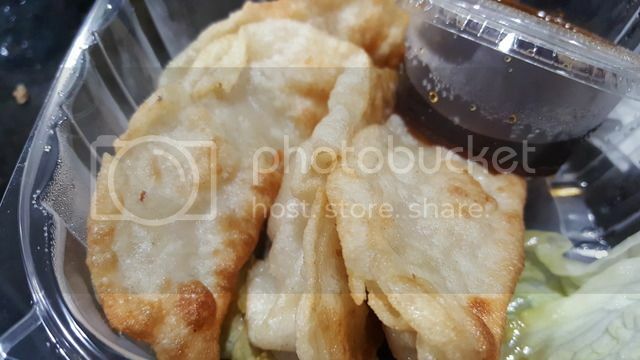 All of the area Cantonese places (including his) pretty much serve the exact same things with a very similar flavor profile. If he changed the recipes (for the better) people would stop ordering as it is not what they would expect. What would be ‘traditional Chinese’? It would be heavy on organ meats (similar to the menu posted above). He did not elaborate on what other meats could be used. I find it difficult to imagine that the organ meats to be so widespread? I understand that much of his country might be poor but surely some have risen above and developed a new cuisine based on some of the better cuts? He had no interest in adding traditional items to the menu. Looking online it appears it happened months ago. With 2 bars and a rumored huge menu. ... that has a similar concept. ... right down the street. How is that place anyway? Great lunch today at Poor Phil's. There's something about BBQ, where people, probably skilled in their backyards, say, let's do this for money. In addition to what's posted above, there's a BBQ place set to open on North Avenue, where a Harold's stood for a few years (just east of OP Avenue), and there's another BBQ place, Blackbox Betty or something, slightly west of OP Av --both of these places are on the Chicago side--that's catering only but did do a pop-up last week and may do more in the future. Sadly, that one dinner the OP Boys had at the place on Roosevelt has horribly scared me (and scarred me towards) local BBQ. I'd like to be proven wrong, but skeptical. BTW, the one place that seems to be thriving, Ben's, at Austin and North, I do not much care for, too much Accent or season salt or something like that in the rub.